Why would I need self storage in Lawrenceville, GA? There are a variety of reasons why you might need self-storage in Lawrenceville, GA.
How much is a storage unit in Lawrenceville, GA? The cheapest storage unit in Lawrenceville, GA is $21.00 per month. What size storage units do you have available in Lawrenceville, GA? In Lawrenceville, GA we have sizes that range from 4'x5' to 20'x45' to suit your storage needs. How much is it for a 4'x5' storage unit in Lawrenceville, GA? The cheapest 4'x5' storage unit in Lawrenceville, GA is $22.00 per month. Lawrenceville is a mid-size suburb of Atlanta, just 30 miles from the capital city's downtown center. Its population has grown steadily since its founding, and recent decades have seen especially significant growth. The city is home to several historic landmarks, colleges and universities, as well as a number of parks and recreational facilities. The city of Lawrenceville is the second-oldest city in the Greater Atlanta area, officially incorporated in 1821. The city was named after Captain James Lawrence, who was a naval commander in 1812. 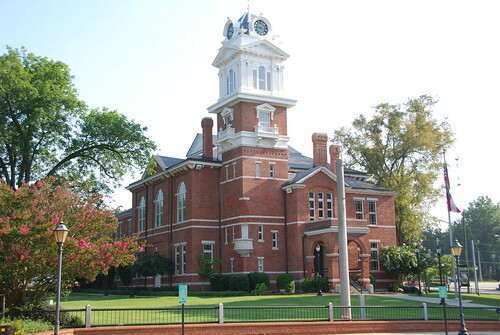 Its first courthouse was constructed in 1824, a brick building that was the area's first permanent court. Although that courthouse is no longer standing, you can still visit one built a few decades later, in 1855. The town square was established in the heart of the city, where it's still located today. Lawrenceville was originally a farming community, but it's grown significantly over the years due to cotton manufacturing, livestock, brick manufacturing, corn and lumber. The city of Lawrenceville offers scenic surroundings that provide a quiet retreat less than 30 miles from the bustling capital of Atlanta. Fine dining, family entertainment and community events are all part of the Lawrenceville lifestyle. There are also several medical facilities within city limits, as well as the Gwinnett County-Briscoe Field Airport. Lawrenceville has a lower-than-average crime rate, which makes it a popular choice for both families and young, single professionals. It also provides a variety of job options, attracting many commuters from neighboring communities. The presence of large companies like Peach State Federal Credit Union, Atlanta Biologicals and Scientific Atlanta has created an active job market in Lawrenceville, which is good news if you're planning to join the local workforce. The award-winning Gwinnett County Public Schools District serves the schools of Lawrenceville. There are also two public colleges in the city: Georgia Gwinnett College and Gwinnett Technical College. Utilities: The City of Lawrenceville Electric Department provides electricity to most of the community, with limited areas being served by Georgia Power and Jackson EMC. The county oversees water and sewer services. Garbage and Recycling: Your trash and recyclables will be collected curbside on a regular schedule. You won't receive disposal cans; instead, you are limited to a certain number of bags per week. Transportation: Gwinnett County Transit and Xpress GTA provide public transportation in and around Lawrenceville. Homes in Lawrenceville are less expensive than many of its neighboring communities, just slightly higher than the national average. Prices have been steadily rising in Gwinnett County as a whole, which could mean you'll receive a good return on your home investment. If you prefer to rent, you'll be able to choose from a variety of communities, many of which provide amenities like swimming pools and on-site gyms. Our lowest priced units in Lawrenceville, GA average $38.36 per month. 1408 people have reserved units in Lawrenceville, GA in the past 30 days. There are 28 locations within Lawrenceville, GA's city limits. There are 13 locations in Lawrenceville, GA that offer AC and Heating features.